Happy 5th Birthday Birchbox! how nice is it to return to a Birchbox posts since being away on Holiday. This September's box was first opened by little sister as she gets excited opening parcels. Her words 'this covers everything from head to toe'. And I agree, here are the following picks I received this month. 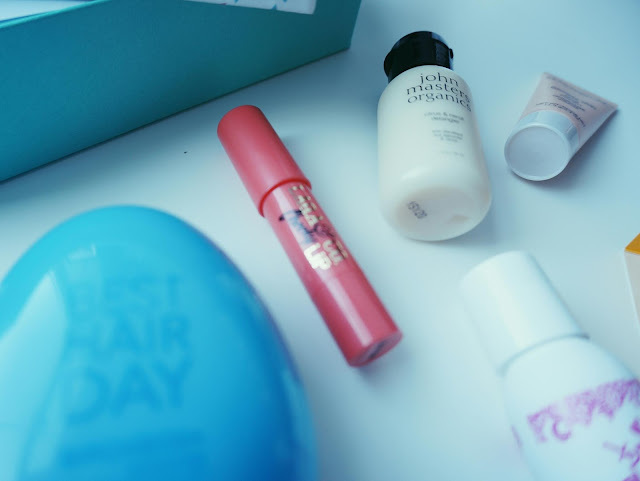 First off with hair products.The first item that caught my eye was the: BIRCHBOX BIRCHBRUSH, a hand held egg shaped hair brush that de-tangles and leave your tresses know-free. To accompany the birchbrush, is the JOHN MASTERS ORGANICS DETANGLER, containing coconut oil (which we all know is a great mask for your hair) which can be used as a leave in product or can be washed out to nourish your hair. Now with face items: An exfoliator by LAURA MERCIER | FACIAL POLISH, a gentle cream exfoliate containing micro beads to gentle buff away dead skin cells. A LAQA & CO LIP PENCIL IN CRAY CRAY, a coral peach coral which can double up as a blush. The crayon glides on very smooth and is extremely pigmented. The BENEFIT | PROFESSIONAL: LICENSE TO BLOT, a mattifying blotting stick used to combat oily t-zones for up to 6 hours. And last of all, the BEAUTY PROTECTOR | BEAUTY WASH, a foaming in-shower body wash, which can also be used in your bath. I am a fan of the BEAUTY PROTECTOR HAIR MASK, so I am eager to try this out. 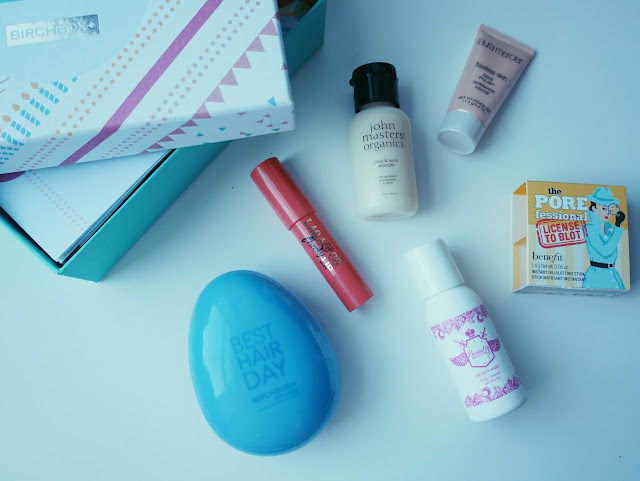 What did you receive in your BIRCHBOX this month? If you haven't subscribed and would like to here is my referral code. The birchbrush looks so cute, it reminds me a little of a tangle teezer actually! 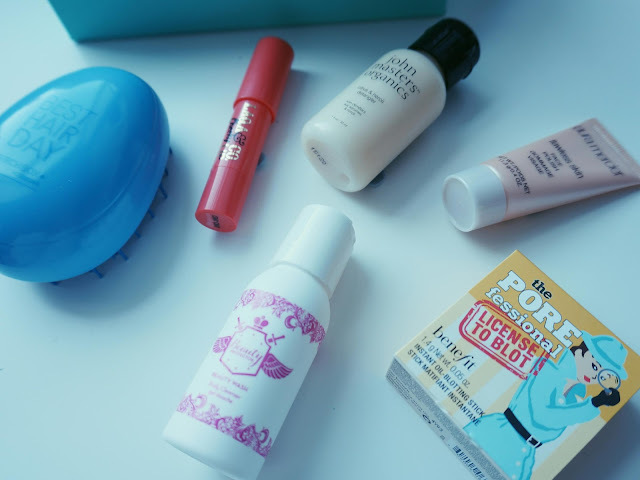 I love Benefit's license to blot, it became my ultimate handbag essential in the summertime!